I'm still working on the mast! The lower mast is now complete, save for the radar platform, and having to remove on of the upper mast supports in order to fit the platform. So that means I've added the U section base parts; drilled for the hinge and hydraulic rams and brackets for the aerials. The latter were really fiddly as I decided to make slots in which to solder them but ended up breaking several drill bits trying to chain drill slots! The upper mast is also done and with working LEDs for the nav lights and blue and orange flashing lights. The two nav lights are wired in parallel, so only one pair of wires to feed through the mast. The blue and orange lights have separate +ve wires for separate switching but a common -ve. 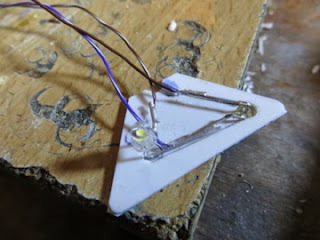 The platforms were made by sandwiching 0.75 styrene sheet with channels cut for the wiring between two pieces of 0.25mm styrene. 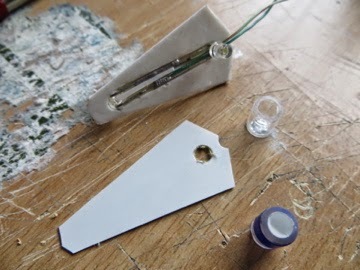 Finally, for now, the port and starboard nav light boxes have been folded up, having been drilled for the LED wiring. The plugs on the bottom are aluminium tube and are a little over scale but necessary to take the LEDs given the size of LEDs and the boxes. 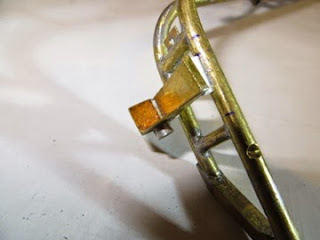 I first soldered the boxes to the mast frames but having looked at reference photos saw that they are on brackets. 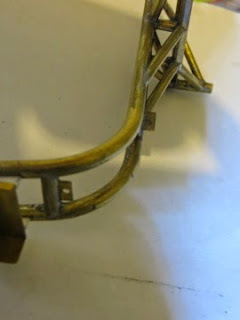 Far too fiddly for me to make from brass and solder so I settled on 0.75mm styrene and superglue. Not ideal but relatively solid. 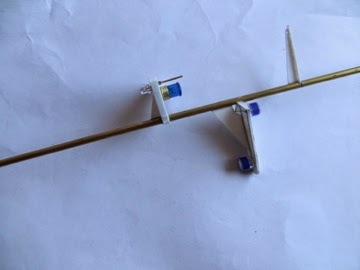 The next jobs are to fit the mast platform, add the small brackets (cable ties on the full size boat) to attach the wiring conduits and then to add the bracket for the attachment point to the side rails on the flying bridge. Then it's the 'H' aerial on the mast top. Oh, and I need to make the CCTV camera that's underneath the mast platform. Hopefully, it's then time to paint. The finish line is in sight for the mast, even if I've no idea how long it'll take to finish the boat!